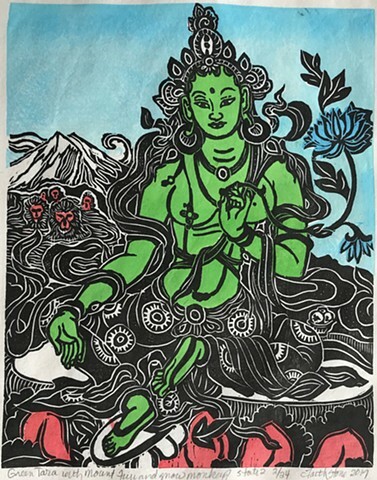 I carved the woodblocks for Green Tara during art residency in Japan while staying at the base of Mount Fuji. I like to bring my Buddhas along where ever I travel and often have them set in local landscapes. This piece was more complicated than many of my earlier works. I carved 5 blocks and hand pressed each artwork on Inshu Kozo Japanese paper with 10 passes of the baren. Green Tara is considered the most accessible goddess. She has one foot coming down from her lotus as if to say - You need me? Here I come. Here, she is in a Japanese setting with Mount fuji and snow monkeys. I would look at Fuji-san every morning as I began carving and realized I needed to have her in the artwork. Mokuhanga is the traditional Japanese style of woodblock prints. The block is printed onto Japanese Kozo or mulberry paper by hand rubbing with a barren. The inks used are sumi and watercolor inks. Mokuhanga is a labor-intensive old school printmaking practice. Typically a separate block is carved for each color. This artworks has 5 carved woodblocks.